At the end of January, I broached the subject of Mindfulness. I was about twenty days in on my, certain to be short-lived, meditation practice and you all NEEDED to know just how Zen I was! This is a screenshot of my Progress from the App. 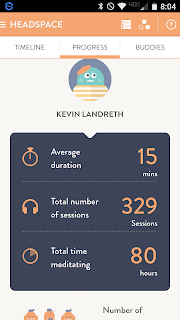 In 2015, I spent EIGHTY hours in meditation! Do the math. That's 3 1/3 TWENTY-FOUR hour days spent in silence, simply trying to give my racing brain a small rest. The results, believe it or not, have been nothing short of phenomenal. For most of the past 10-15 years, about every third breath I have taken has been a long, deep, mournful sigh.That's probably due to the fact that I hold my breath most of the time. To say I'm wound a little tight would be a gross understatement. I am impatient, grossly intolerant, and stay about half pissed off. The sheer weight of my personality just crushes me! I'm not exactly sure what I meant by it. But I do remember looking at T and saying, "I'm just not sure I'm gonna make it." A change was needed. I just wasn't sure of what kind of change. As I described in the January post, a couple years prior, the Denton Yogi had suggested a new meditation app that had a 10 Day Free Trial. Meditation was certainly going to be impossible for me. But, why not give it a try? It was cute. Kinda fun. I talked about it for 10 days. But at the end of the free trial, the app asked for a credit card number and my meditation days were over. I'm not a hippie, for crying out loud! But on January 5th, I pulled up the app, got out my credit card and purchased a whole year. As cliche as it sounds, the rest is history. I will not bore you with the details. But most of my tens of readers are friends of mine on Facebook. You know that my Angel Baby spent three months studying abroad. You remember my Bride spending nearly two weeks in the Mediterranean. Big Tuck was nearly a month in the Middle East! These are just three life events that would normally drive me insane! But add to that you.....You are a veritable smorgasbord of insanity! I get calls almost daily from friends and some people I don't even like and listen to their stories of death, divorce, restraining orders, joblessness, drug-addicted children, aging parents, cancer....this list could go on and on and on. Add to that, the daily flood of images of bombings, beheadings, mass shootings, and the IDIOTS who are in power, or those who are seeking to be in power, acting like they give a popcorn fart and can actually do something about it! My brain is pooped! It just needs a rest. And that's what I've given it almost every day during 2015. You can obviously see that my progress board does not read 360. I have not been perfect. But that's why my little Tibetan Monk calls it a practice. What that screenshot above does not show is my current "run streak." This morning was Day 159 in a row. I see subtle changes. I know the long, deep sighs are fewer and far between. It seems as though I'm rolling with life a little smoother. But my actual mirriors are those closest to me. And they are OVERJOYED and DELIGHTED that I have committed to this life change. So, on January 5th, I have no alternative than to renew my subscription. I actually look forward to going to bed at night because I know that when I wake up, I'm going to get a little relief. I'm going to sit in silence and just breathe. I'm going to start my day by giving my brain a little rest. I get to give my mind some space. That space allows me to get through the day. It helps me tolerate you! But more than that, it enables me to put up with me. After all, as you are all very well aware, it IS all about me! The trip to England, back in November, revived a topic that has been swirling around in my head for a couple of years. This disturbing thought arose as I learned of the daily activities of the evangelist there at the Summer Lane Church. In listening to Trevor share, I was reminded of what I often hear missionaries talk about when they come home from the field. Trevor's activities and these missionaries' work never seem to match up with what I see here in the States. They seem to do it differently over there. Their priorities are not in sync with the way we do "church" over here. I find that troubling, as evidently, we are all reading the same book. In the Epistle of James, the author writes in the first chapter, verse twenty-seven, that "Religion that our God and Father accepts as pure and faultless is this: to look after orphans and widows in their distress and to keep oneself from being polluted by the world." Religion that is pure. Religion that is faultless. The word "religion" is no longer socially acceptable today. Even religious people refuse to use it as they ALL claim they are enlightened and they have learned to be SPIRITUAL, instead of that nasty, politically incorrect term, RELIGIOUS! But the Bible speaks of religion. Specifically, James speaks of pure religion. And the obvious question that comes to mind is, Why are all these spiritual people so opposed to practicing pure religion? Trevor ministers daily to elderly widows. There are a number of widows in that small congregation and they live in public housing that houses many more. He sings with them, prays with them, plays bingo with them, and offers transportation for them all over the city of Birmingham. He refers to them as "old biddies" and they just laugh at him because they love him. He exemplifies unconditional love. a true servant heart, and a purpose driven life. I hesitate to use the word "orphanage." Even among my tens of readers, there will no doubt be a couple of you to take umbrage with that word. But it's the only word I know. The Old Man tells stories of going into those Orphanages in Russia and other parts of Eastern Europe that I simply will not relate in this post. Most of you are simply not equipped to hear of some of things he has witnessed. But, seldom do I hear a missionary returning from the field, that he does not speak of their daily work in the orphanages. Their stories break my heart as they look after those children in their distress. Over here, however, we are spiritual! In our church foyers, we have huge tables and hundred dollar banners hanging, advertising our Retreats at a 5 Star Conference Center. We can't wait to get away and learn how to be spiritual! Kicked to the side of that table, almost in a corner, is a box for which the church bulletin has reminded us to donate a can of corn or a tube of toothpaste because the truck from the "Childrens' Home" will swing by on Tuesday to pick it up. Spirituality is at the Conference Center! Pure Religion is in a cardboard box. I am writing this for myself! I have NEVER been on the property of a "Children's Home" in my entire life! I did swing by the Funeral Home a few weeks ago to offer condolences to a widow. Yay me! Big pat on the back for that unselfish act of service! I'm not making any promises or resolutions. I'm way too self-centered to follow through on them. But, I'm thinking about being more religious in 2016. And I'm thinking of it in terms of Pure Religion.